What a difference 18 months makes. I last reviewed Commvault for Tech Field Day 9 in June 2013 in a series of posts. My post-TFD9 review focused on their new-at-the-time Sympana 10 release, but prior to the event, I did some old-fashioned financial analysis, since they’re a public company and the data is available. I dug into their finances to get an idea of what was going on in two posts, a general overview one, and another one with better analysis borne of better data. 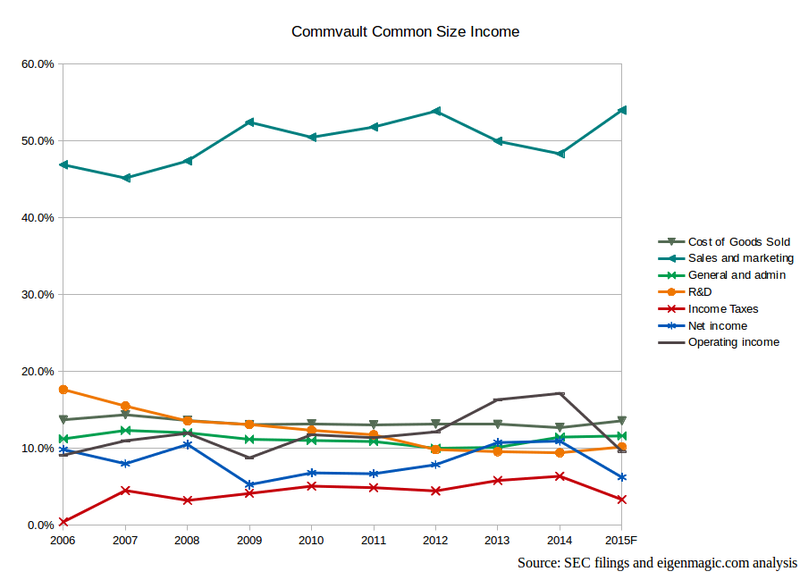 I still have the spreadsheets, so I fired up SEC’s EDGAR service and grabbed the latest 10-K and 10-Q filings to see what had been going on in the past 18 months. 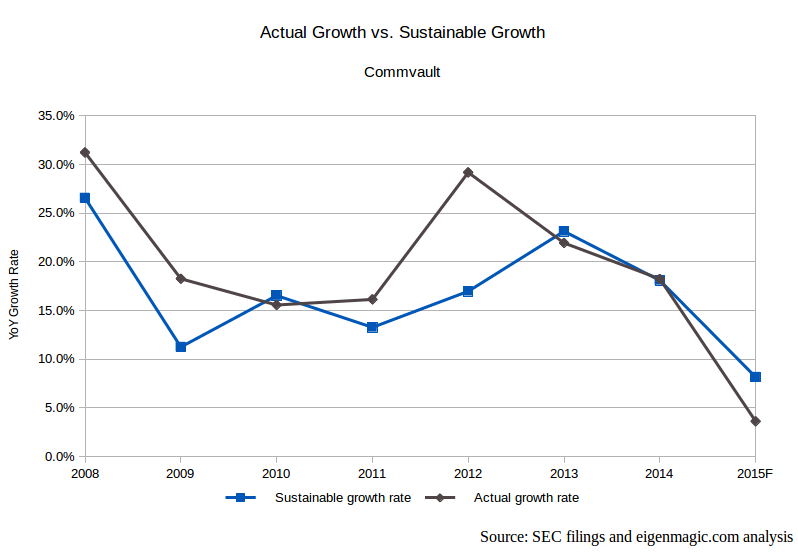 The actual growth rate and the sustainable growth rate have both dropped substantially. This means both the real and potential growth rate are both down, and investors don’t like tech stocks that grow less than 10% a year. It’s too much risk for not enough return. In fact, if we add another chart, you can see why people have sold off the stock. 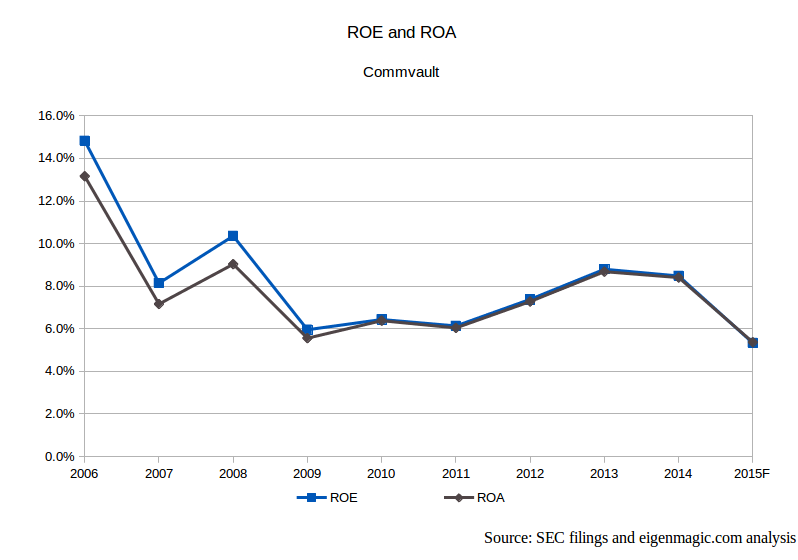 This chart shows that the investor return from Commvault stock is now likely to be under 6% for 2015. I’ve used the same method as last time for forecasting the FY2015 results: double the 6 month results at end of September quarter, which proved to be pretty close last time I did it. (My forecast was about 3-5% under the actual results for revenues, net income, etc.) A lot of people have presumably decided they can make more money at similar risk by investing elsewhere, so they sold Commvault and bought… something else. But screw Wall Street. It’s full of gamblers who don’t make things, so who cares what they think, right? Let’s look at what the company’s actually doing. For that, we need more charts. Yay! A quick note on these charts. In my last set of data, there was an extraordinary event in 2007 relating to a re-valuation of deferred taxes which skewed the data. In this version of my spreadsheets, I’ve removed the one-off event so we can see the longer-term trend. This is something I should have done last time, but didn’t because reasons. Lack of product sales. Pretty simple. In fact, Commvault have admitted as much, and there are some lovely articles by the handsome and smart Chris Mellor from The Register explaining what happened. 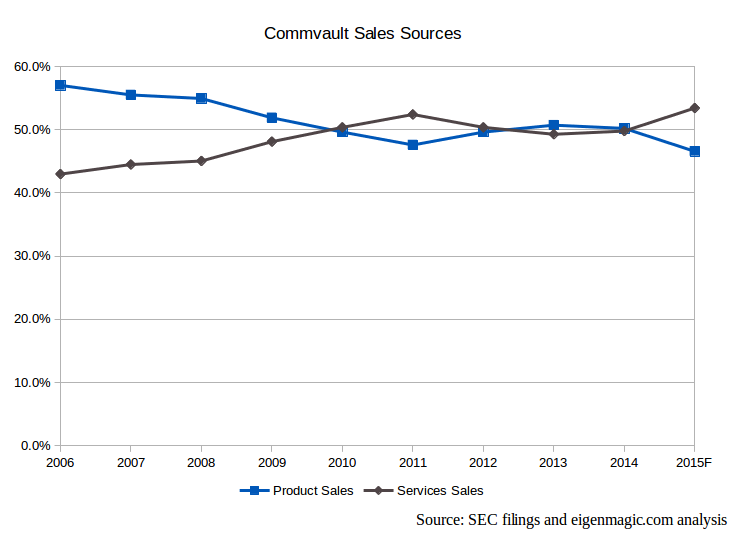 Basically, Commvault screwed up their sales force in North America, and it’s going to take a while to fix. 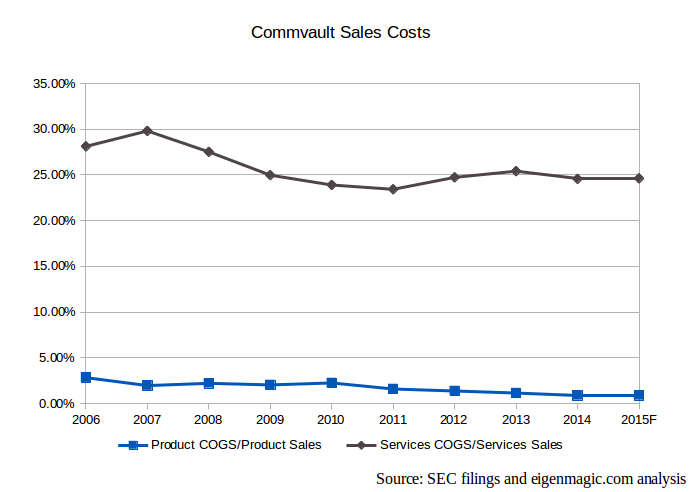 As we saw last time, and can see again in the chart below, services sales cost a lot more than product sales, so if Commvault make more services sales than product sales, the overall cost of sales is higher, and Commvault make less money overall, so any increase in services sales has to be about 25% bigger than any fall in product sales to make up the difference. That didn’t happen. After starting to recover, product sales are back below services sales again. Bummer. Commvault picked a bad time to drop the ball. They face pretty strong competition from newcomers like Veeam and Actifio who are hungry to grow, and have more focused products. The aggressive marketing and new pricing options from competitors, particularly Veeam, has forced Commvault to respond, rather than dictating the game themselves. Commvault face the same problem any well-established company has to face: how do you serve existing customers and also appeal to potential new ones? You have a bunch of legacy code, and special customisations for large and important customers (like a three-armed sweater, I recall someone at TFD9 describing it) so you just can’t move as fast. It’ll be very interesting to see what Commvault has to say at VFD4. How are they going to appeal to the highly virtualised crowd who could choose other options? How do Commvault differentiate? How are they managing to stay relevant when R&D spending is around 10% of revenue? Is the money being spent in the right places, or should they perhaps spend some of their cash on building new, cool stuff? Then again, if they do build new, cool stuff, but there are no sales people to sell it, who cares? I sincerely hope that the cause of this problem is as simple as not hiring enough (or the right) sales people, because that’s relatively easy to fix. It’ll take time to show up in the financial results, but product sales should start to increase once the right sales people are out there selling the product. I hope this is true, because the alternate reason for product sales being slow is that people don’t like the products. We’ll know which within 6-9 months, so keep an eye on those 10-Q filings! 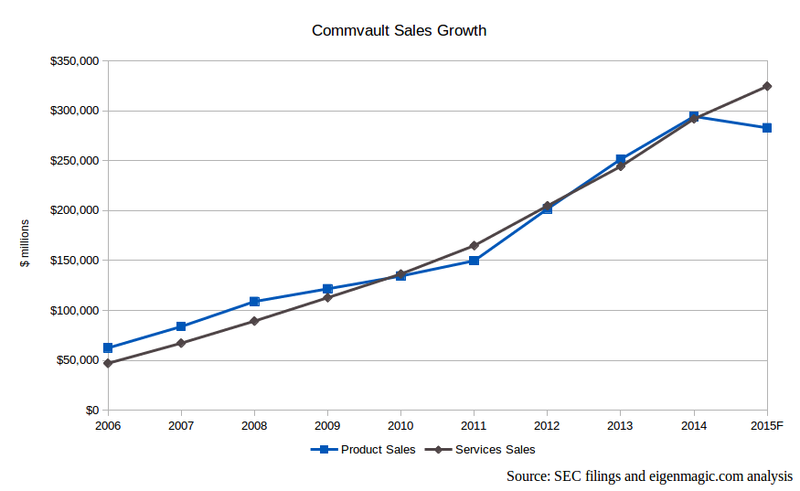 Some good news on the cash front: Commvault aren’t holding on to as much! Less good news is they’re spending it on a new corporate headquarters, in Tinton Falls, New Jersey. The project was going to cost $70 million a year ago, but according to the company’s 10-K filing for fiscal 2014 (a mere two or three months later) the estimate of the buildout is “approximately $135 million” which is nearly double. I have no idea why there is such a large discrepancy, especially since that NJBIZ.com article is linked from Commvault’s media page on their website. The headquarters appears to be finished, since it’s now Commvault’s official address on the Commvault website. I guess the Google satellite view is a bit old, but it’s supposed to look like this going by the engineering company doing the construction. Shiny! Tagged actifio, commvault, EDGAR, SEC, veeam, VFD4. I wonder how much Commvault have lost their way. Latest versions of the software implement features like VM management. Exactly what is their platform now? Data protection, orchestration? At some point you have to accept you have a backup product and look to get into other areas with new software, not just continue to build onto the current one. I’ll ask them this week!